Last week’s Single of the Week was chosen by Steve Cann and was Jona Lewie’s 1980 hit You’ll Always Find Me In The Kitchen at Parties which was in the chart in May 1980. 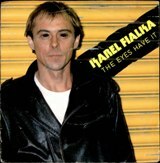 His second appearance on Top of the Pops was on Thursday 22nd May, the song that followed it is the subject of this week’s Single of the Week chosen by Andy Woollard and it’s Karel Fialka’s debut hit The Eyes Have It which was his only appearance on the show with that song as it had peaked at number 52. He was born Karel Francis Fialka in Bengal, India, to a Scottish mother and Czech father. He was discovered in 1979 by Tim Hart, one of the guitarists with Steeleye Span whilst he was working with the New Wave/Electro band The Monochrome Set. Later the same year Karel had his debut UK release with a song called Armband on the Red Shift label which garnered some airplay by both John Peel and Mike Read. His first success abroad was with a song called Eat Drink Dance Relax which stepped onto the chart in both Holland and Germany. After the song dropped out of the chart, Karel seemed to disappear, but actually he moved to Bristol to run an art gallery and then a farm in Berkshire. He continued to write songs which included the track Maybe Someday for Cliff Richard which appeared on his 1983 album Dressed for The Occasion. He also got together with Paul Roberts, the frontman with Sniff ‘N’ The Tears for some collaborations. Around the same time he was in the chart with The Eyes Have It, his wife gave birth to their son Matthew. Karel wrote a song about him and eventually, six years after his first hit, he returned to the chart with the Hey Matthew which is the song he’s now best remembered for as it was a hit in several countries including the UK where it reached number nine. In 2009 Karel made another comeback with a new album called Film Noir which was a homage to the trapped souls of black and white gangster movies.